Today we had the pleasure of showing Mr. Juan Gutierrez of Aliwen Chile around our El Bruc plantation. In Chile they have serious issues with regard to drought, especially the area above Santiago towards Peru which offer thousands of hectares of degraded lands, in some cases due to extensive copper mining. Sven Kallen of Volterra explained the Cocoon system and showed Mr Gutierrez around the 2017 plantation (picture below left with fast growing olives) as well as the new biochar experiment (picture right, planted a month ago). 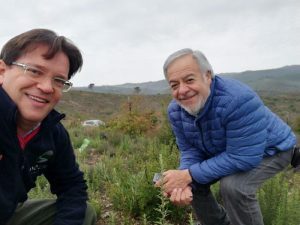 Aliwen is specialised in reforestation and restoration projects and foresees an important role for Cocoons in Chile, thus supporting future market uptake.